My first souffle. And it worked! And it was divine! So proud I could pop. 150ml thick bechamel sauce made using SR flour rather than plain – I use this method. Half the amounts then reduce the amount of milk again by about 50ml. Toss the squash with a little olive oil, seasoning and mace. Roast in a 200 oC oven for 40 mins until soft and golden brown. While the squash is roasting, make the bechamel sauce and set aside. 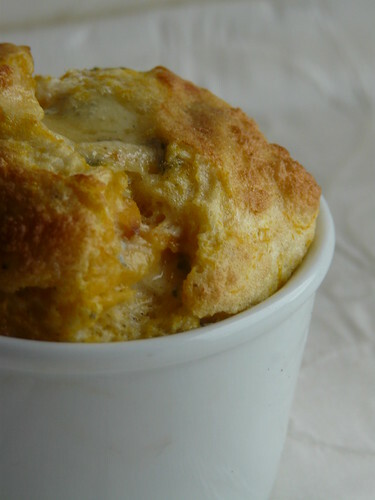 Mash the squash, parsley, egg yolks and cheese (if using) together. Mix in the bechamel sauce. Season carefully. Whisk the egg whites until they are stiff. Use a metal spoon to fold the egg whites very carefully but thoroughly into the squash mixture. Spoon mixture into lightly oiled ramekins until 2/3 full. Sprinkle lightly with parmesan and bake in a bain marie (baking tin with 2m of water in it) for 20 minutes until risen and golden brown. I enjoy your blog so very much .. I can’t wait to try this recipe and think it’ll be perfect for our Thanksgiving family dinner!! 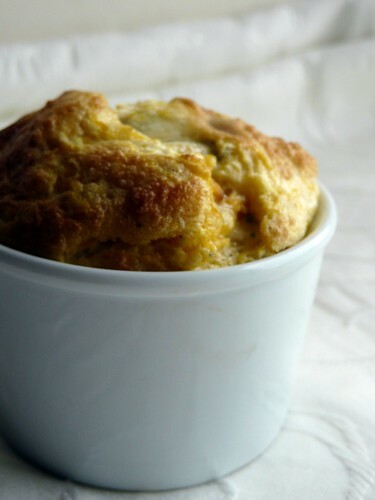 I’ve never dared try a souffle but now… maybe! Oh beautiful. I know what will be on my table very, very soon! It looks absolutely perfect and I bet it was delicious too. Wouldn’t have thought to try this with a squash but what a great idea! Judy – Thank you and eeeek! Might try the recipe again at the weekend just to make sure it’s exactly right if you’re going to use it for Thanksgiving! Johanna – That’s exactly what I did! Christina – Let me know how it goes! Please!